For Easter dinner, I wanted to make an old fashioned strawberry shortcake for dessert. When I think of an old fashioned dessert, I always think of strawberry shortcake made with biscuits ( just like grandma’s). Place flour, salt, baking powder and sugar in a food processor. Pulse a few times to mix dry ingredients. Add butter and process until the mixture looks like bread crumbs. Add almond milk and pulse until a soft dough forms. Place dough on a floured surface and roll out to a 3/4 inch thickness. Cut out biscuits. 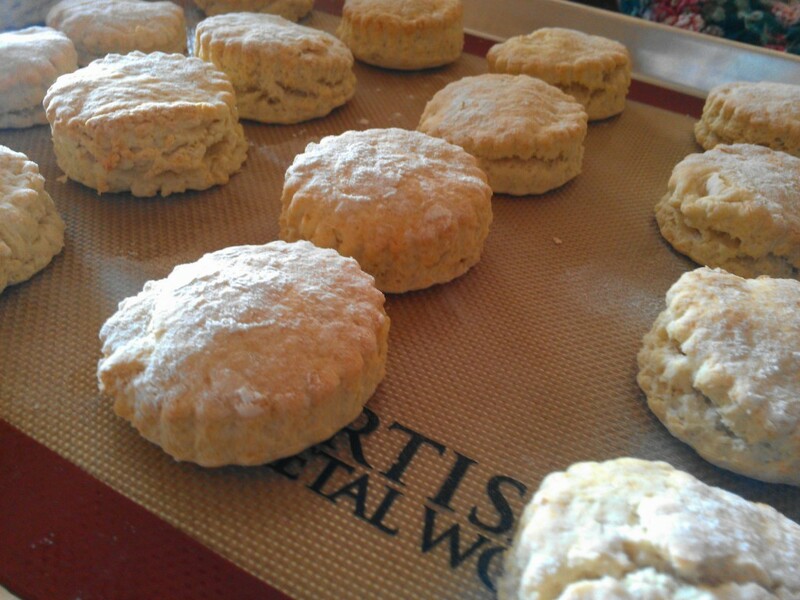 Yield: about twelve 2 1/2-inch biscuits. The vanilla-almond milk gives these biscuits just a hint of dessert-like sweetness. Now you need to prepare the strawberries. I bumped this up a notch from the basic sugared strawberries by adding honey and balsamic vinegar. Prepare strawberries. Toss with sugar and set aside. Heat honey slightly in microwave. Stir in balsamic vinegar. 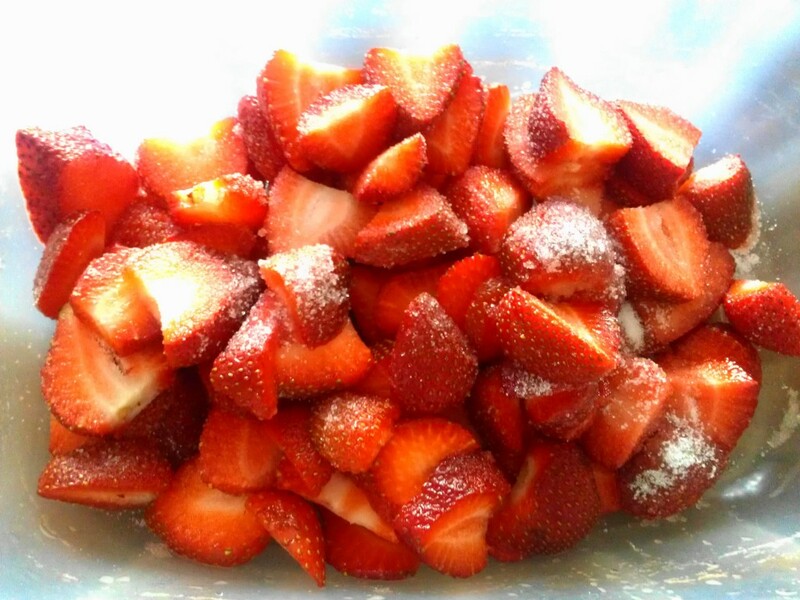 Let cool to room temperature and then toss with strawberries. 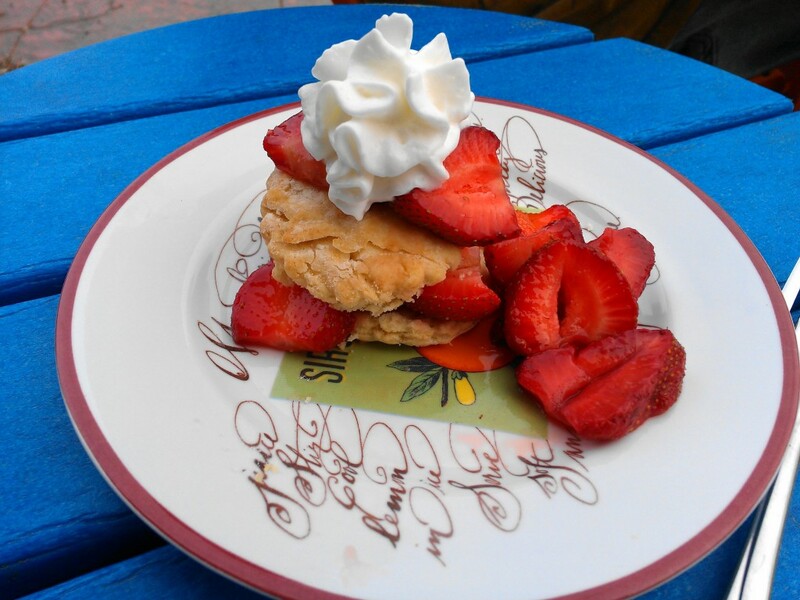 Split a warm biscuit, layer in some honey-balsamic strawberries…. Of course, you have to top this off with some good old fashioned whipped cream. 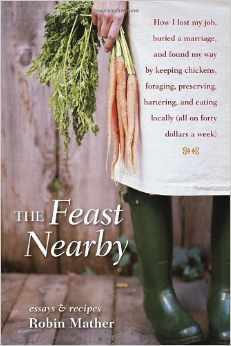 I am currently reading The Feast Nearby by Robin Mather. Strawberry-shortcake-for-dinner night—why didn’t I think of that? So far, I am loving this read. Each essay/chapter is concluded with three or four recipes. I have a feeling I will find some more inspiration from this book. Last year The Hubs made this strawberry planter for me. This picture was taken last spring and unfortunately, only three plants made it through the winter. We are currently in the process of replanting. I am hoping to harvest enough for another batch of biscuit shortcake (or strawberry-shortcake-for-dinner night)! The book sounds like a good read — the amazon review says she had to make the fresh-local meals on a small budget, which already is different from Kingsolver (who once bought ALL the local meat in the county to have a big party). I put it on my list. You make a very good point about Kingsolver. I am really enjoying Mather’s book. I read from her Mother Earth bio that she was suspended from school for reading this “radical” magazine in a HS class in the 70s. That is too funny! Debra, you have me drooling way over here in Florida. Nice job with those shortcakes! We use local honey too when sweetening desserts. It helps with allergies too, getting local honey in your system. Win-win! On my GF post you mentioned a GF pizza that gave your friend an issue, Do you recall the brand of the pizza? We tried Udis and i’m not sure if that caused a flare up or if it was the grits. Yes, we prefer more natural solutions to health issues is there is a safe alternative! Thanks, Tina. I can’t wait until we have ultra local honey from our back yard. Sent you an emailregarding your question. Your biscuits have turned out so puffy and beautiful. And your are right about the shortbread and strawberries…a divine treat! 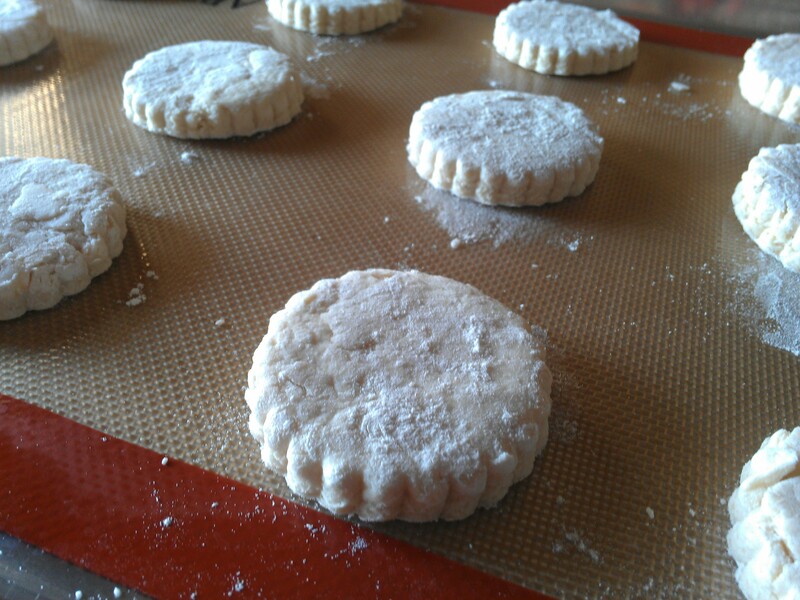 I am really beginning to like powder milk biscuits better than buttermilk or the yeast variety. They are certainly easier. 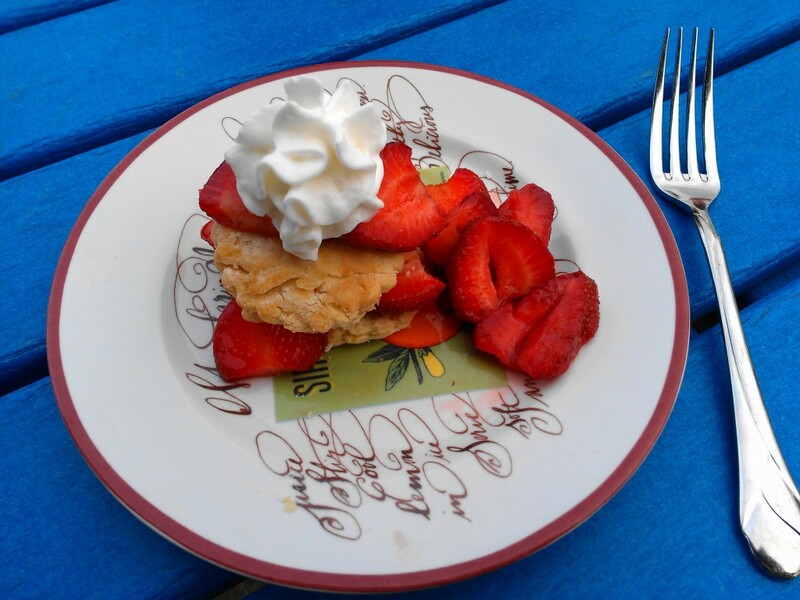 Strawberry shortcake for dinner – YES! This sounds really good – love the twist with the honey and balsamic! My Mom always made hers by mixing honey only into the strawberries and that’s what I like best for sentimentality’s sake. So yums. I love the hint o’ honey taste with the strawberries. This dessert makes me sentimental as well. BTW, beautiful photos of the finished shortcake!! What a perfect spring recipe. And the book sounds terrific. I love books that incorporate recipes! That is about all I read anymore—foodie books. Each and every year the first sign of a Strawberry Shortcake brings back shimmering memories of not only the chance at Spring but also the Strawberry Shortcake doll my daughter had when she was little. For just a few years, we would make Strawberry Shortcakes and the three of us would have a tea party. (me, my daughter and of course the doll, lol:) Ours was usually just plain ol’ delicious Strawberry Shortcake but it sure was yummy. You have brought it to a new finer level and I’m sure it is/was just as delicious and memorable! Thank you so much, Louise. I always enjoy your comments. We are off tomorrow to a foundation-run nursery that helps employ differently-abled individuals. They have the best plants and it is for a worthy cause. I got marvelous strawberry plants there last year. Strawberry shortcake with biscuits is the ONLY way to have it! My grandma use to make it this way as well and it’s so much better than using “shortcake”. What a beautiful strawberry dessert. Hopefully, you have some leftover biscuits. I love one of those with some homemade jam. Actually getting ready to defrost some now for breakfast. YUMMY YUMMY YUMMY!! Strawberries are so wonderful and your old-fashioned dish is beautiful! Thank you, Kelli. I’m ready for more. I love strawberries and these shortcakes look amazing! Thanks, Gloria. 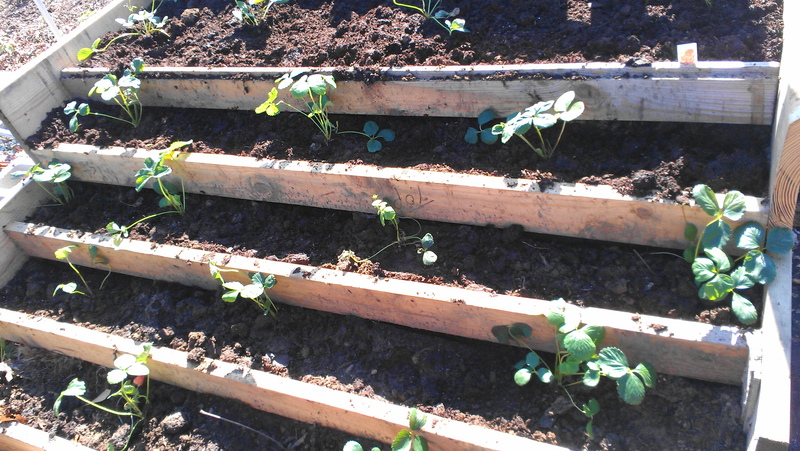 We got our strawberry beds planted yesterday. Can’t wait to harvest our own!